Raynolds said that in its first four years in New York, large sheaths of granite came loose from the surface of Cleopatra's Needle. An additional 780 pounds of stone were lost when a waterproofing company tried to stop the decay with a creosote and paraffin treatment in 1884. But the last major study of the monument, conducted by the Metropolitan Museum in 1983, found that the rate of decay had stabilized. The Parks Department says now there is no significant ongoing erosion on the obelisk. "And yet, you know there are still signs that there's some gradual erosion occurring on the surface," Raynolds said, adding that you can see patches of decay where the obelisk's native pink color appears on the surface of the stone. [I]in May 1914, the Central Park commissioner with the help of Columbia University's James Kemp and the Metropolitan Museum of Art's William Kuckro began extensive restorative work on the obelisk during which they removed a paraffin layer, which was added soon after the obelisk's erection, and they added a new waterproof coating. 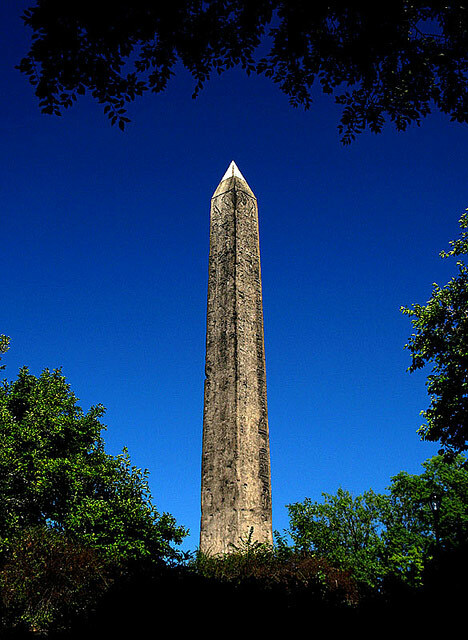 At this time the obelisk's condition was described as "scaling on all sides," and, "in some sections the shaft was blank for several feet." The NYTimes' description from 1914 appears to appropriately describe the damage, or deterioration, similar to that which is depicted in photographs on Hawass's blog.